Cyclamens are beautiful flowering perennials that produce interesting blooms in shades of pink, purple, red, and white. Because they are not frost hardy, many gardeners grow them in pots. Like most container plants that live for many years, there will come a time when cyclamens need to be repotted. 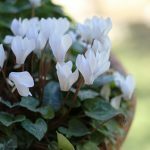 Keep reading to learn more about how to repot a cyclamen plant and cyclamen repotting tips. Cyclamens, as a rule, should be repotted every two years or so. Depending upon your plant and its container, however, you may have more or less time before it fills up its pot and has to move. When repotting cyclamen plants, it’s really best to wait until their dormant period. And cyclamens, unlike many other plants, actually experience their dormant period in the summer. Faring best in USDA zones 9 and 10, cyclamens bloom in cool wintertime temperatures and sleep through the hot summer. This means that repotting a cyclamen is best done in the summertime. It’s possible to repot a non-dormant cyclamen, but it will be harder on you and the plant. When repotting a cyclamen, pick a container that’s about one inch bigger in diameter than your old one. Fill your new container part of the way with potting medium. Lift your cyclamen tuber from its old pot and brush off as much old soil as possible, but don’t wet it or rinse it. Set the tuber in the new pot so its top is about an inch below the rim of the pot. Cover it halfway with potting medium. Place your repotted cyclamen somewhere shady and dry for the rest of the summer. When autumn comes, start watering it. This should encourage new growth to emerge.